I think that's the MOST question I've been asked through all of this. This Summer, June 13th, 2014 they had Open Casting. I actually found the information floating around Google+. After pondering and thinking. I opened my Bible and read the 1st passage that I had opened up to. Read. Contemplated & Prayed. I don't take these things lightly. Like I said there is a Spiritual Component to me researching my Ancestors. I knew it could be anything. Whatever it was I was gonna have to Accept it on behalf of my Family. I Got my laptop out and applied. 2 weeks later My point of Contact asked if I could do a interview? I said YeS! Thank Goodness. I practiced for a week and my DNA Cousin Shelley Murphy Family Tree Girl! click link. Hello Mother! She helped me out for a evening of conversation. She doesn't know it, but she knows now! We had wanted "Face Time" so it was perfect timing. My contact for the show, She emailed me details on the date and time. My interviewer made me so comfortable it was like a Great Conversation with someone you meet unexpectedly. It was the longest 3 weeks of my Life! I was wondering everyday and hoping they could find something. Did I say some off the wall thing? Was I boring? All kinds of thoughts ran in my head. Finally she called me back around July 23rd and said; Can you come to St. Louis in August? Sure; when? She replied we have taping on August 21st through the 23rd. During those 3 weeks, I'm waiting by the phone, checking email constantly through all this period. Making sure I didn't miss any calls or communication online. I had all 3 items with me at all times. Cell phone. Land line. Laptop. It was Hilarious and nerve wrecking! I was a bunch of nerves for a month. I only shared with a handful of people. I didn't want anyone to know I applied in case I didn't make it! I would only know! So finally I broke down in a Whisper to her. Did I make the Show? she says YEs!! We liked your Story and you made it!!!!! YEs you can tell Everyone your really gonna be on the Genealogy Roadshow! You know I had to ask her like 3 to 4 times through the whole conversation. I had MaDe It! She said I was more than Welcomed and that I had 10 spots available for family and friends! YEs True! You made it! Your gonna be on the Genealogy Roadshow! You made IT! My Application had been Accepted! I went BoNkeRs! I had never tried anything like this in my Whole Life. I too always wondered? How do they pick Folks for these shows? Well now I know! The process went without any hiccups. It was smooth I couldn't even attest to any other way it would go. My Experience was a Once in a Lifetime Dream. It spoke so much as to who My True Roots was and I was Ecstatic for Her and for Me! This is who it was Truly for. It was all Done out of Love for my Family on all sides. They choose to pick Grandaddy Ike's people. Out of 100,000 applications between 3 Cities. New Orleans. Philadelphia. St. Louis. William Ivey was born in around 1817. I've seen as early as 1812. What was going in this Country where it says he was born in South Carolina? The State of Alabama had Freed it's Slaves by The 13th Amendment which was on February 1st, 1865. 1st Census that I can find William Ivey is in 1870. In 1853 William & Minty Welcomed and Praised God for their 1st Son. 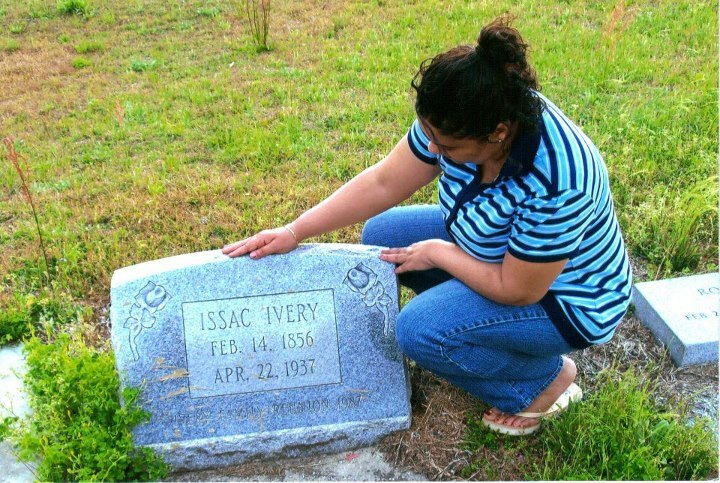 Issac "Ike" Ivery! He is who My Family honors every 2 years in Reunion. This is where Genealogy Roadshow at St. Louis Union Station on PBS! comes in for my Family. Right under the St.Louis Historical Landmark at the Grand Union Station. Click here for more Information. I can now tell that Whisper Secret out LOUD to you all! My question on application was? I needed to know was my Ivery's Slaves? Free Persons of Color? How did they attain their Last Name of IVERY? It took them 15 years, 15 Years...15 years to be able to go to the Courthouse in Pike County, Alabama to legally get married. Only for the simple reason they were FREE! They were SLAVES in PIKE County, ALABAMA as we know of today. Genealogy Roadshow provided proof they were not Free People of Color. 11 other Couples got married that same day. Prior to their Marriage I'm sure since they had their 1st child in 1850 which is 15 years earlier I just know they "Jumped the Broom" on the Plantation! By 1865 they had 6 children born to their union already. Including Granddaddy Ike! he was born in 1853. He was 12 years old when he saw his Daddy and Momma being married. I know what I was doing at the age of 12; so I can just "Imagine"! I dream of me being there with watchful eyes, being happy and content. Bullock County, Alabama was formed December 5, 1866. Before that it's made up of parts of Pike and surrounding Counties. I've learned over time when the borders for the counties changed. In 1870 they were living in Ridgely, Bullock County, Alabama. Married for 5 years legally. Together for 20 Years total! William was 53. Minty was 35. I can see where Granddaddy Ike was getting his youthful ways from! Granddaddy Ike was 70 in 1923 when his last child was born! William & Minty Ivey 1870 Census, Ala. In 1880 William was 63. Living in Bullock County. 1881 he is still Living. I know from his daughter Isabelle (Belle) Ivery was marrying Charles Haynes on May 28, 1881. On the marriage license it states where were they married? It was wrote; the above parties were married by me on her Father William Ivey's Place. When I saw that! I was doing the Genealogy "Happy Dance". I just stared at that last LINE. He was still with us! So we know until 1881 he was still here at the age of 64. After that his location remains unknown to me. I can't find them on 1900 Census for Bullock County, Ala.
My Family has a great start on finding more about Grandpa William and Granny Minta. This was a Emotional Journey. A time of Reflection and Contemplation. When you do this for so long and you get this Item. It's Overwhelming. So much is lost and gone. We might never find it all. So when this happened for Us. This Document we received. It's truly treasured. This Marriage License it might seem like a small thing....it is Not. It is my Family's Oldest Document now. That one piece of paper tells a Story for all of us Ivery's! It says who we are. That We exist. We come from this Soil. This Land. We were Slaves. We were Free. This is confirmation. With this Document I can go further.There is more Work for me to do. 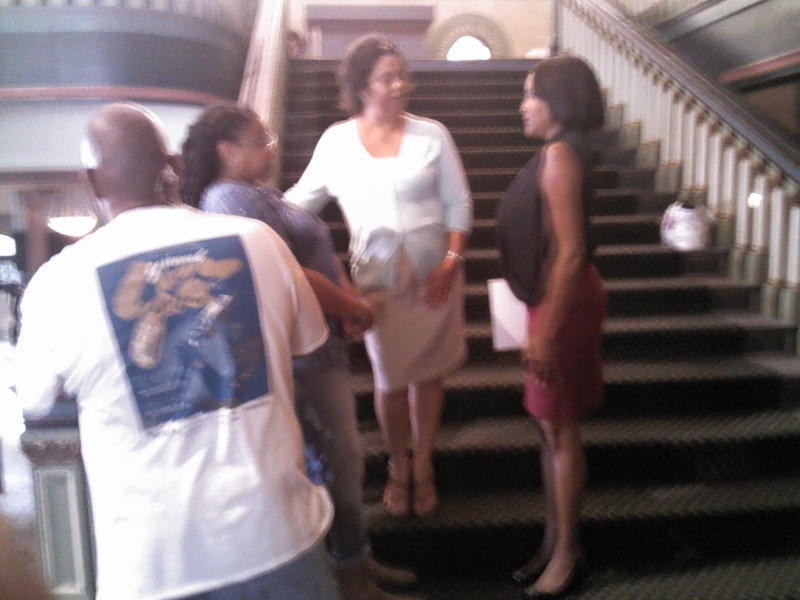 Along with Potential Slave Owners from the research papers Genealogy Roadshow gave me of what they researched. It goes to show you also how Important On-Site Research is necessary. You can't find everything Online. I will do it lovingly for as long as I can. This also gave me more Confidence. As long as I have been doing genealogy and I feel seasoned. I try to be as accurate as possible. Sometimes I get nervous. This was a lesson that I was doing my research correctly. It confirmed to me I can do this. My work can be passed on. It was relief to have a 2nd pair of eyes looking at what I do and that they know I can appreciate what they do as Professionals. This is hard work. It takes time and so much patience. It's not for the weary. There are many joys! The sorrows come equally with it. It's about Perseverance and Preservation with Collaboration. So I advise anyone who comes to you with interest. Love in their heart and conviction. Please take the time to help them. To share with them. Commune with them. We can not do this work alone. It takes a Family like mine who patiently walks on this journey with me anytime I need answers. Pictures. Documents. Or just to talk. I Truly stress My True Roots does not do this Alone. We All have a Story. I'm just trying to TELL Mine, Ours. Many Thanks and Gratitude for PBS. Genealogy Roadshow. Mr. Krasnow. Kenyatta Berry and My Producer LaMonte! My Researcher LaDonna. You two know who you are! 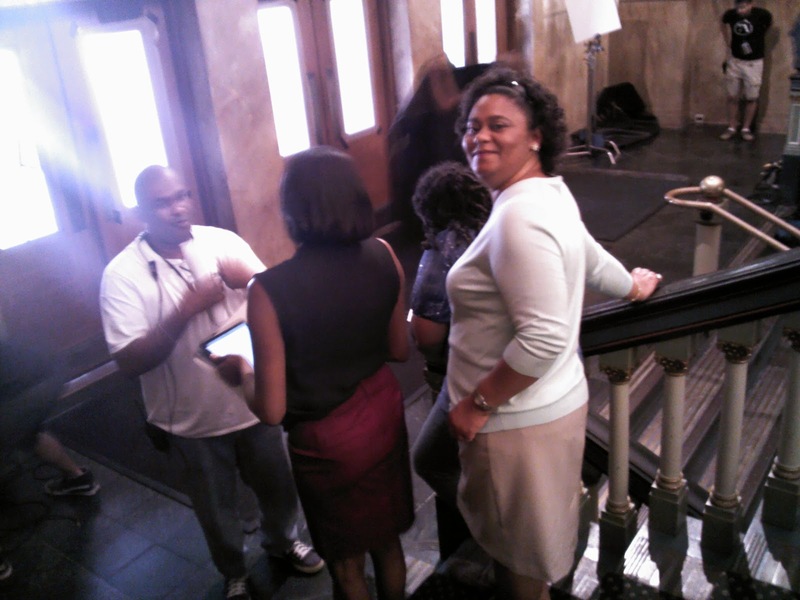 Lisa Landrum and all the behind scenes people like Josh and Mary! 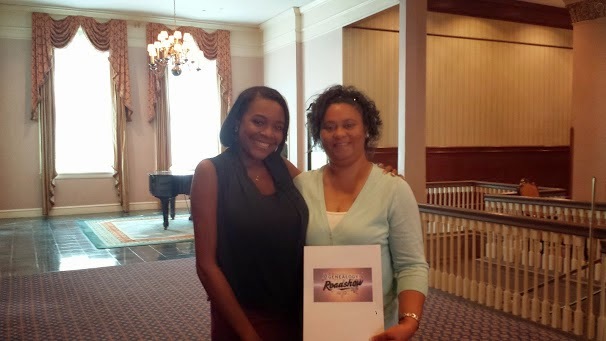 Ms. Kay Porter for extending a Invitation for Pre-Screening to my Family from Nine Network out of St. Louis! My Cousin James, Bea, John Kite. Mommie & Daddy. My Beloved Aunt Sallie Bea. She always said she knew my Heart from Looking into my Eyes. Family. Bug&Pidge, my Parents. 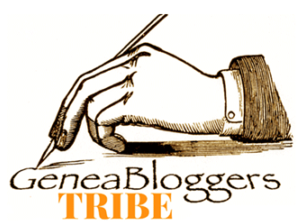 My Fellow Blogger Community. Everyone was on this Journey with Me, no matter what or how we have come to know each other. I took ALL of you along with my Ancestors. You were all there in St. Louis with me in Spirit. So this is just as much as my Journey as it is Yours. I look forward to working with Pike County Courthouse. A first for me. This has been a time. 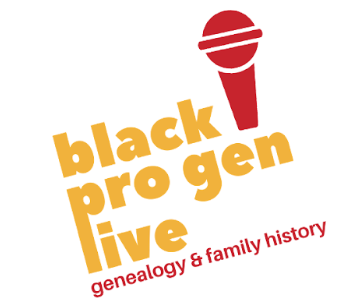 I'm grateful for all the opportunities and the chance to be accepted on the show to exhibit that you can find your Ancestors with a little work. I'm thankful they showed my Family as a Example. The St. Louis Union Station episode was February 1oth, 2015. 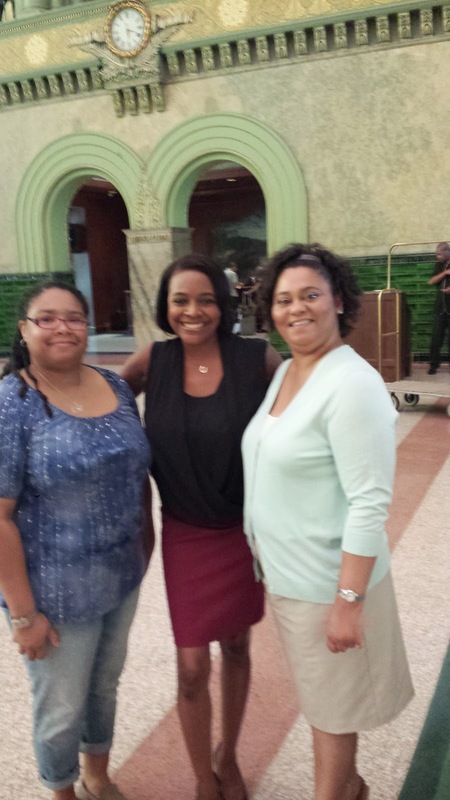 I'll always Remember and Cherish for being on Season 2 of Genealogy Roadshow on PBS. During Black History Month and near Grandaddy Ike's Birthday. It was meant to be! Our Ol'Slave Granddaddy Ike Ivery whom my Family holds in high Esteem and Honor. He has earned his rightful place 162 years later! His Birthday is February 14th, 1853! Granddaddy Ike & Me. 2009. You ushered in a Great Birthday Gift to your Descendants! We; your Proud Descendants.We now have your Parents in their rightful Place to take us a bit further. We understand. WHY Family is so Important to you? Why you felt so compelled? Always keeping your 23 children together. What you learned from your Father and Mother that you carried the tradition on. It will Continue. So may it Be! You were there Granddaddy Ike, that Day! as a Witness. Now this Marriage Licence will bear Witness to All. You were there....You were there. Thanks to my Friend and Filmmaker Susan! (click here) She has Supported me so much in this Journey. 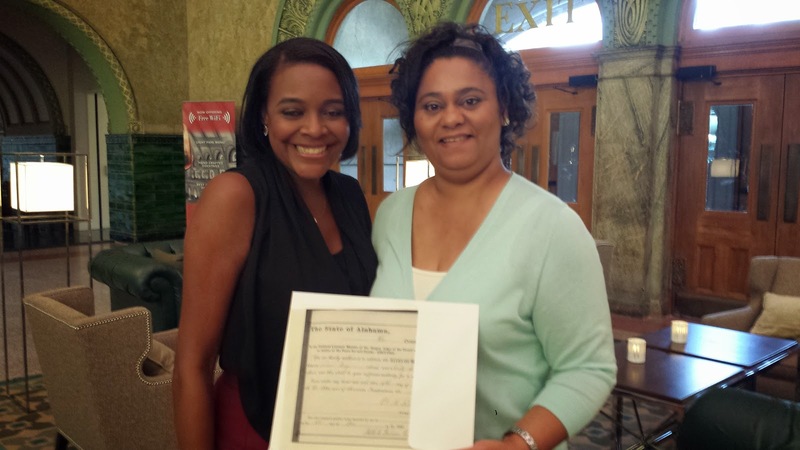 She can help you Preserve your Family History as well. Look below at Link at what she did for US! Dedicated to My 1st & Only Granddaughter: Jai ! I hope I made you Proud. Leave me a NoTe or a Comment! Dear Heavenly Father, I'm so "Grateful". it's Flowing from my Heart. Labels: Genealogy Roadshow, Ike Ivery, My True Roots., PBS., Pike County Alabama, Slaves. Ivey. I'm perplexed; what these actually are? I think the confusion comes from several different uses I have seen them being used. Daddy would keep these up high in the cabinet. He especially kept one on his nightstand. Growing up he used it as a coaster to keep his cup of water that he took upstairs nightly. That was a ritual for him and Mom. Their Cup of water. 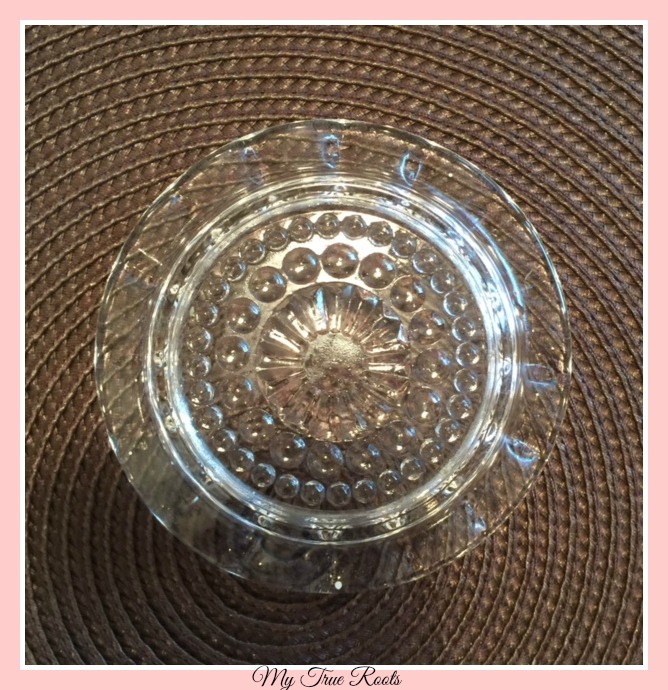 Reason for using this glass dish he didn't want to watermark the dresser. He also kept a paper towel underneath this saucer for extra security. I actually thought they were ashtrays. 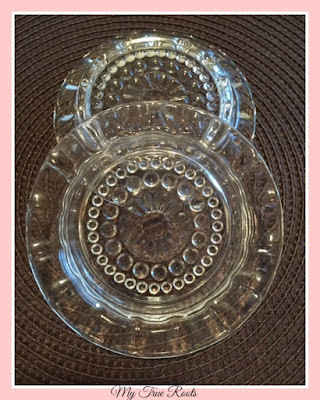 My Husband seems to think they are Tea Cup Saucers. 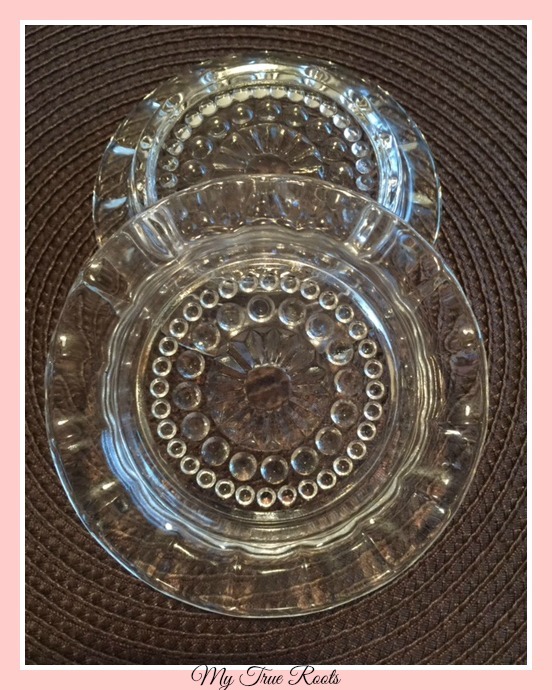 It's a lot of fun photographing and preserving my Memories with these Heirlooms pieces started by my Blog Sister Jeanne! This is a Great way to preserve the Memories and History of the items you have passed down from family. Here I can always look at them for later in case anyone from the family ask, Where did that go? I keep these on a kitchen shelf. The glass is thick and heavy and very colorful. There are wicks in them and a turn handle which is just for decorative purposes. Made in Hong Kong. Not sure how Mom acquired these? I don't think they were used. It's just nice to know someone tried to replicate a Wick Lamp from the past into a small modern piece. They have been in my childhood home since I was little. I'm surprised it wasn't something I broke. I'll tell you a little secret. I use to play with these too. 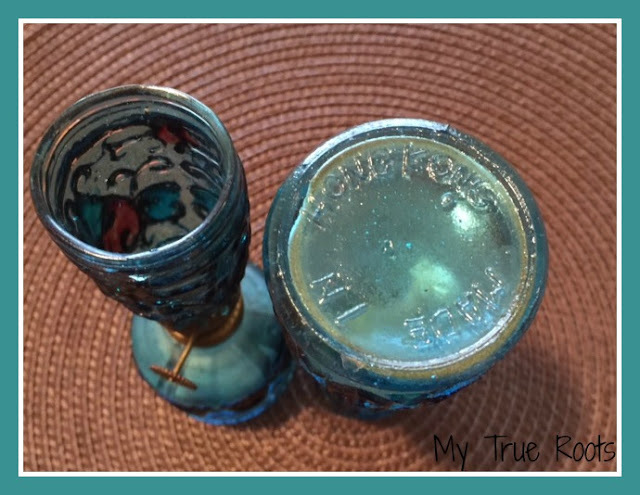 Just another Keepsake I decided to keep and take home with me and turned into a Heirloom. Do you have any Oil Lamps with Wicks? 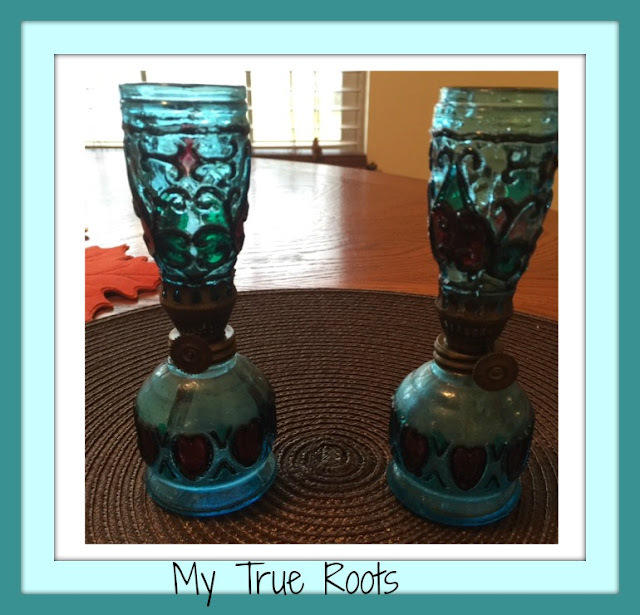 Labels: Family Heirlooms. Genealogy. Notes to Myself. African American Slave Research. Thought of this Idea about making a Chart on where our Ancestors Births occured starting with ourselves. He made a Colorful Chart and posted on Facebook and before you knew it! We all went Ballistic! I want ONE! So there you have it. An idea made to the Public went spreading all over the Internet like a Fire! Here's a Story on how this All got Started! A Little Thing that went Viral! Join in on the FUN! Make your Generational Chart. I've seen Countries I haven't seen before. It's fun to see how far and near our Ancestors went. I love seeing the Pennsylvania and Alabama births. You know I have got to ASK! Where are yours from? 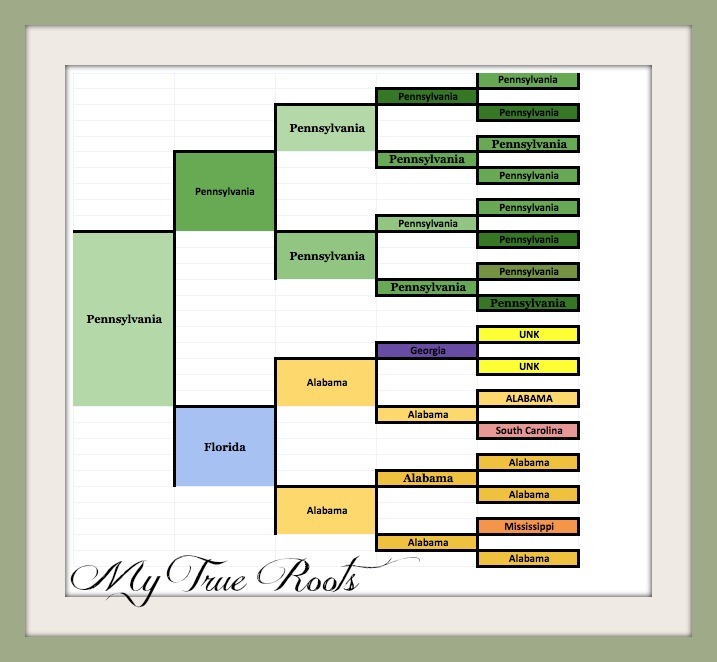 My Pennsylvania Direct Maternal line goes pretty far back and then into the Old Country. Strong ties in Pennsylvania. Don't forget to use #MyColorfulAncestry on Social Media! You will see other beautiful Charts from all over the World. Where is your Colorful Ancestry from? Labels: My Colorful Ancestry. Genealogy. Notes To Myself. True Lewis. Ancestry. Black Pro Gen. I had to place this on my Blog. I don't know if something will happen to it. It's getting very fragile. My Easter Bunny. I made this at Tri- Community Elementary School. I remember having to bring the toilet paper roll. 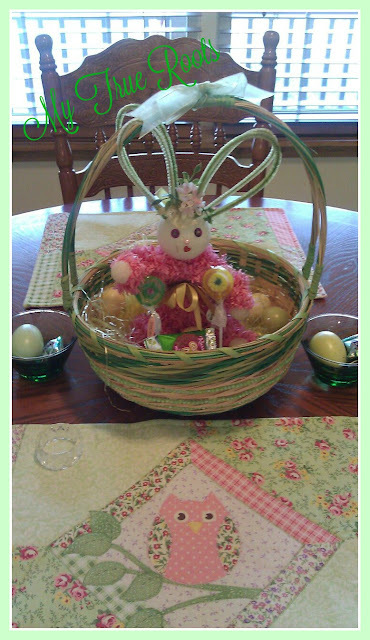 Everything else like the eyes, pipe cleaners along with the decorations and Easter Grass were provided. Somehow Mom managed to maintain and keep it. I do remember as I got Older when Mom would set the Dining Room table she would use this as a Centerpiece as I have done here in my Home many times. I'm so glad this was saved and I can pass it on. So to my future Descendants this is what Granny made in Elementary school as a Easter Project to take home to my Mommie for Easter. We were always making special gifts to make for our Parents in the 70's at school. Family ChartMasters • 7 Generations. My Family Honors The Life of Ike Ivery our Ol'Slave. We gather every 2 years since the 70's for a Family Reunion. Our next one will be held in Orlando, Florida. 2017. 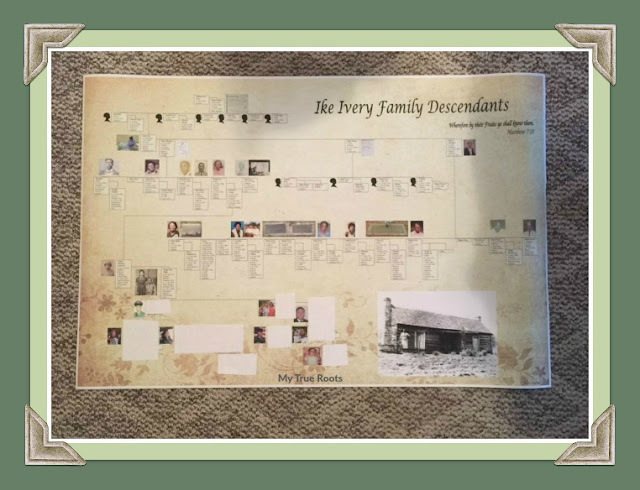 I love looking for different Genealogy Products that will make my Family History Research work stand out. I'm always looking for something detailed and special for my Family. This is where Family ChartMasters comes in for my Family. I attended Rootstech 2016 in Salt Lake City, Utah. I made my Appointment to meet with a Consultant 2 weeks in advance. I met Ms. Janet on a Thursday at 4:20 pm at their Booth. We discussed and went over ideas I had on how we could make this Chart come to life. This is the end product of what I had in mind. 24 x 36 in stature. There is no Limit to what you can do for your Chart. My Chart is on File so I can always go back as New Information needs to be added or corrections. For future references I can go back to reorder. It arrived fast and in a Shipping Tube. Which came with directions on how to preserve and retrieve it from the tubing. If you fill out a Survey for them, they donate a 1$ to the National Center for Missing & Exploited Children. I had a few revisions and they worked with every move I made. Next is to shop for a frame. I'm excited about Presenting this to the Family. It feels so good to see all that I have come from. From a Man named William born in 1812. To Pudding in 2007. As a little girl, I would hear everyone say names of Importance being related to Charlemagne or a President, or they came from here and there. Well, I have that too. I Present to you the Ivery's! I can't even express my Thanks to Family ChartMasters and their Staff for making this Masterpiece for me. It will be cherished for a Centuries to come. Thank you for all your patience, kindness and professionalism through the whole process. On behalf of my Family, we the Ivery's. Wherefore by their Fruits, Ye shall know Them. Labels: African American Research. Slavery., Family ChartMasters. Notes To Myself. My True Roots. Genealogy. HALIFAX-Dorothy Hoover Sweigard, age 92, a resident at ManorCare in Chambersburg and formerly of Halifax passed away on Thursday, October 11, 2012 at Manor Care. She was born in Allport, PA the daughter of the late William and Eva McDonald McCully. She was a retired nurses aid, a member, Sunday school teacher and violin player at the former Jacob's UM Church in Halifax and a member of the Farm Women's group. Dorothy enjoyed traveling and gardening. She was the widow of Marlin Hoover and William Sweigard. She was also preceded in death by her son Ronald W. Hoover and her granddaughter Darlene Kunkle and sisters Alice, Ethel and Helen, brothers William and Thomas and step daughter Carol Doc. Surviving are three daughters Nancy Bennett of Fayetteville, Marilyn Dietrich (Jeffrey) of Wiconisco, Peggy Shultz (Scott) of Canon Falls, MN; a step-son Eugene Sweigard (Janice) of Halifax; 13 grandchildren; 33 great grandchildren; 5 great great grandchildren; many nieces and nephews. There will be a viewing on Tuesday, October 16 from 10-11 am at Hoover-Boyer Funeral Home in Millersburg. Services will begin at 11:00 am. Burial to follow at Jacobs UB Cemetery in Halifax. Donations can be made to St. Jude's Children's Hospital 262 Danny Thomas Place Memphis, TN 38105. Labels: Dorothy McCully Hoover Sweigard., Genealogy. Notes To Myself. My True Roots.